^ a. The state's GDP wis $175,992,016 thoosan o pesos in 2008, amount correspondin tae $13,749,376.25 thoosan o dollars, being a dollar worth 12.80 pesos (value o 3 Juin 2010). 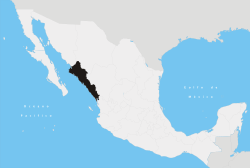 Sinaloa (Spaingie pronunciation: [sinaˈloa]) offeecially Estado Libre y Soberano de Sinaloa (Scots: Free an Sovereign State o Sinaloa) is ane o the 31 states which, wi the Federal Destrict, comprise the 32 Federal Entities o Mexico. It is dividit in 18 municipalities an its caipital ceety is Culiacán Rosales. It is locatit in Northwastren Mexico. It is bordered bi the states o Sonora tae the north, Chihuahua an Durango tae the east (separatit frae them bi the Sierra Madre Occidental) an Nayarit tae the sooth. Tae the wast, Sinaloa haes a significant share o coastline on the Gulf o Californie. The state covers an aurie o 57,377 square kilometers (22,153 sq mi), an includes the Islands o Palmito Verde, Palmito de la Virgen, Altamura, Santa María, Saliaca, Macapule an San Ignacio. In addition tae the caipital ceety, the state's important ceeties include Mazatlán an Los Mochis. ↑ "Senadores por Sinaloa LXI Legislatura". Senado de la Republica. Retrieved April 6, 2011. ↑ "Listado de Diputados por Grupo Parlamentario del Estado de Sinaloa". Camara de Diputados. Retrieved April 6, 2011. ↑ "Relieve". Cuentame INEGI. Retrieved April 6, 2011. ↑ 6.0 6.1 "Mexico en Cifras". INEGI. Retrieved April 6, 2011. This page wis last eeditit on 10 Mairch 2018, at 21:03.